The Wilkins Group, which is headquartered in Nottingham, is celebrating success at its Sri Lankan hub after receiving LEED Gold Certification for one of the most sustainable packaging units in the region. Boasting rainwater harvesting, with up to 700,000 litres of water being collected last year alone, the firm has now been awarded the prestigious Leadership in Energy and Environmental Design (LEED) accreditation, which has taken years to achieve. With rating systems for the design, construction, operation, and maintenance of green buildings, the badge of honour is one of the most popular green building certification programs used worldwide. The Wilkins Group opened the two-acre site in Sri Lanka in 2015 as part of a 3M USD investment in the region. Sri Lanka was a prime location not only for local customers but UK and EU customers. Being located on major sea routes means the Wilkins Group can offer shorter transit times and has the added benefit for customers in the UK and EU of zero import duty due to GSP+ status. The state of the art factory specialises in garment packaging and offers the largest range of boxer short packs, swing tickets, cartons for lingerie on the market, supplying well-known brands including Hanes, Victoria Secret, Marks & Spencer, Tesco and H&M. The Wilkins Group has landed the prestigious accreditation for the 40,000 square foot factory in Mawaramandiya, which was built on a brown field site as the company strived to create an environmentally sustainable building right from the design stage. The unique design of the factory roof allowed 700,000 litres of rain water to be collected last year which is used for sanitation and gardening. The hub also takes advantage of the sunlight in the region and prides itself on ‘daylight harvesting’, with transparent panels on the roof which illuminate the entire stores and canteen area – reducing the need for electricity. Talking about the latest announcement, Justin Wilkins, sales director said: “It’s fantastic that our hard work to achieve the gold level LEED accreditation has been recognised, both locally in Sri Lanka and globally. 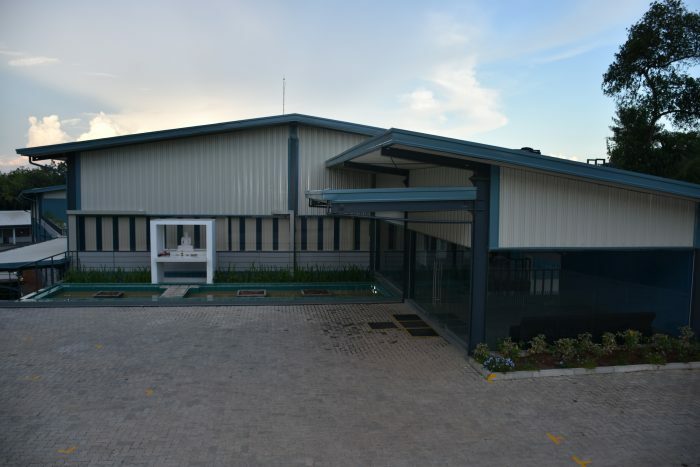 Ahead of many businesses in Sri Lanka, The Wilkins Group have installed one of the most energy efficient AC units available in the factory and it is the first of its kind to be installed in the country. The operation of the factory also paid a key part in the group attaining this highly respected accreditation; it isn’t just the building that is sustainable, all the inks used in printing are vegetable or soy based reducing the reliance on fossil-based products. All carton board and paper used in the factory comes from sustainably managed forests, which The Wilkins Group has been awarded FSC-COC certification for. “We are really proud to have been awarded the LEED accreditation and our mission to be sustainable doesn’t affect the quality of the products. The hub offers bespoke colour management and press control systems to guarantee colour consistency and repeatability in every job.” added Justin. A unique custom at the site is a tree planting campaign to help rejuvenate the surrounding land on which it was built. This campaign is a way of giving back to the environment and the company plants a tree every time they get a new customer, whether that’s for one or multiple orders. So far, they have planted 150 of these trees. Converting over a 1000 metric tonnes of product a year in Sri Lanka, The Wilkins Group is making a big push to move away from plastic and are spending time and money investing in alternatives including wooden and board hangers. As well as the environmental benefits, the Wilkins Group have help benefit the local people and economy in the area, creating job opportunities and training employees. The group is currently the main employer in the area with 125 local employees.